Ammunition. 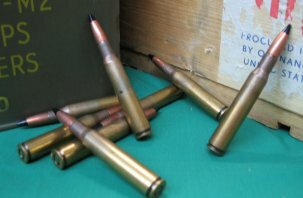 Our showroom is currently stocked with most calibers of high quality rifle and pistol ammunition priced competitively! Our online E-Store is open!!!! We hope you enjoy the new website layout. Our online store is constantly being worked on and updated. All of our basic parts and accessories will be available for purchase with a credit card via the online store with no additional fee! Our collectible parts, accessories, and rifles will still be sold the same way, in our Collectors Only area. Very interesting and special parts, accessories, and rifles will featured in the Gallery of Featured Collector Grade Rifles, with many pictures. Shop Services currently have short turn-a-round times. We finally caught up with all our rifle builds and can now offer very reasonable delivery times on your M1 repair or rebuild and of course receive quality service. Most inspections, barrel work, and minor rebuilds are currently running under one week. Full rebuilds under 2-3 weeks! Please contact us for your M1 rifles service needs!!! Watch our Services Page for additional clean and inspect packages, rebuild packages, and individual shop services! You need to get authorization before shipment to our repair facility. We will post dates and locations of Gunshows we will be attending here. You may call your order or special request before any of the shows we will be attending, and you can pick up your order at the show! You can also arrange for us to purchase your quality U.S. military firearms and accessories at any show we attend. 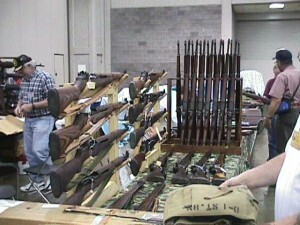 Below is a photograph showing 1/4 of our display at a large East Coast gun show. We had over 60 collectible M1 rifles, Carbines, and 1903 rifles on display plus 4 tables of parts and accessories for the M1 rifle. Due to possible limited availability of table space, or state laws, our firearm display at certain shows may be considerably smaller than normal.